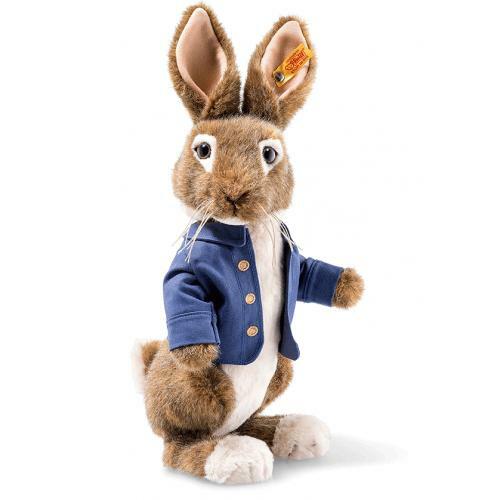 Steiff Peter Rabbit is made of cuddly soft woven fur. His beautiful soft fur colours, are, warm white and a mixture of browns. His inner ears are peach/pink with his mouth and nose being black with a little bit of pink airbrushing. His whiskers are made of cotton thread and his eyes are light brown and black. He wears his blue cotton jacket with embroidered buttons in gold thread. He also carries his famous stainless steel "Button in Ear" and yellow label. 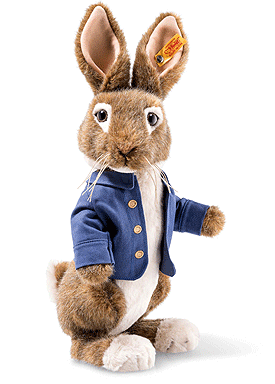 Peter Rabbit and all associated characters & © Frederick Warne & Co Limited. Peter Rabbit, the Movie ©2018 Columbia Pictures Industries, Inc. All Rights Reserved.